About "Pierced For Our Transgressions"
Steve Jeffery is studying theology at Oak Hill Theological College, London, in preparation for full-time Christian ministry. He has a PhD in physics from Oxford University. Andrew Sach studied theology at Oak Hill and is now on the staff of St. Helen's, Bishopsgate, in central London. He has a PhD from York University. 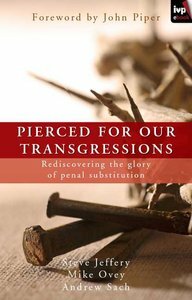 Customer Reviews For "Pierced For Our Transgressions"
The new standard work on penal substitution? This well-written book is a restatement of the bible's message about Jesus' death for our sins. Some people in our world are revolted by the idea of Jesus taking the punishment due to us and are calling it cosmic child abuse. The book's authors deal with objections to this key Christian teaching, and show that it is not a Johnny-come-lately, but has been believed and taught throughout the history of the Christian church. They have also created a website with the same name, which includes useful supplementary material, as well as extracts from the book, and links to talks and music which relate to the book's subject. If you love Jesus Christ and love the message of his death for us, you'll be thrilled with Pierced for our transgressions. If you have questions about how God could send his Son to die for us, it will also be worth reading.